This journey of discovery is one of the most ecologically diverse and personally satisfying expeditions found anywhere. We’ll fly over the towering mountains and massive glaciers of the Coast Range in a small aircraft. After arriving to the beautiful wilderness of Chilko Lake (elevation 3845 ft), we’ll float 120 miles on the crystal-clear, then turquoise, then silty-brown waters of this incredible alpine forest-to-desert river system, which drops over 3000 vertical feet. 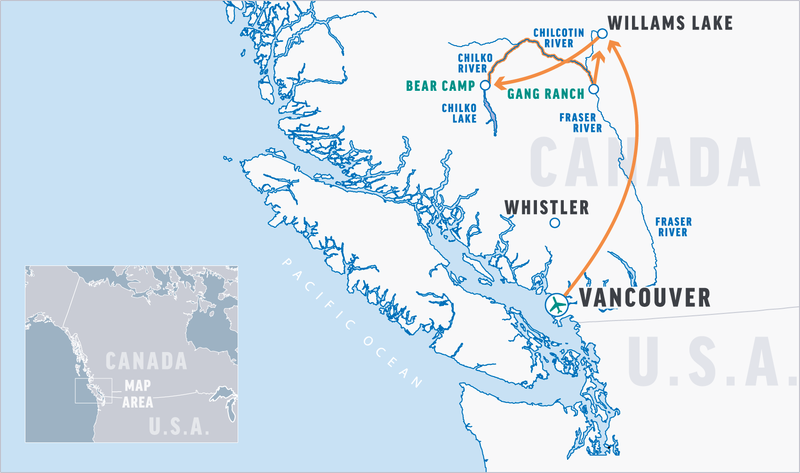 On the last day of our expedition, we’ll fly back to Vancouver, crossing over the 2000-foot canyons of the lower Fraser, and the lakes and mountains of the southern Coast Range. Experiencing such a variety of phenomenal scenery has made guests claim that this eight-day trip was the best of their lives. The details of our flight from Vancouver will be confirmed closer to the date. However, it’s likely the departure time may be as early as 8:00 AM and no later than 12:00 PM. For those arriving to Vancouver International Airport this day, it is essential to arrive a minimum of three hours before our potential departing time; you need to allow enough time for possible flight delays, time to clear customs and time to transfer from the Vancouver International Terminal to the regional airfield at Airport South. Therefore, we suggest arriving one day early. We will board our plane for the incredible flight over the mountains and glaciers. Upon arrival, we’ll transfer by vehicle to our riverside camp at Bear’s Den, a 4-hour drive*, where we’ll meet the rest of our guides and prepare to depart on our expedition down the mighty Chilko River. *Other flight options exist, avoiding this drive – please ask us for details. Upon arrival at our camp, we’ll familiarize ourselves with our new surroundings, discuss the plan for the coming week and then enjoy our first of many delightful meals in the wilderness. We awake at Bear’s Den to a delicious and hearty breakfast. Today we enjoy the amazing sights and adventures Chilko Lake has to offer. You can choose to enjoy an easy hike to Green Lake, a big hike up Mt. Tullin, mountain biking on fun double track, inflatable kayak the Chilko’s upper 20 miles back to Bear’s Den, cast a line for trout, or simply hang out in our scenic riverside camp and prepare for tomorrow’s big water adventure. We’ll board the rafts after breakfast. You will quickly notice that the pace of the river has increased from the upper 20 miles (if you chose to float the river the day before). Today we descend through Lava Canyon and challenge the longest continuous rapids of the trip. Heart stopping hydraulics and towering standing waves cascade for more than 14 miles through deep and narrow lava gorges, making for non-stop excitement. It is no surprise Lava Canyon has become world famous among whitewater enthusiasts. We will choose a secluded riverside camp just above or below the confluence with the turquoise Taseko River, where the Chilko doubles in size. At camp, a delightful evening under the stars and celebration is in order after a fun-filled day of adventure. After a leisurely breakfast, the Chilko River will carry us into the Chilcotin River. The river valley opens as we emerge onto the Chilcotin Plateau. Birdlife abounds and our casual float is a welcome reprieve after the previous day’s excitement. This is a great time to try inflatable kayaking or the oars—everyone will be encouraged to give them a try. Arriving relatively early into camp, there will be time for swimming or plain old loafing around. Try your hand at some fishing, or sit and watch the sunset on the metamorphic rocks across the valley. An early departure will set the stage for an action packed day. In the morning, we will enjoy some friendly Class II and III rapids before arriving at our lunch site near an ancient Indian fishing spot deep in the 1500’ deep canyons. This stop offers outstanding hiking, swimming and, for the more adventurous, cliff jumping into the refreshing waters of the Chilcotin. After lunch we ride the Goose Neck Rapids while Bald Eagles soar high above us. We’ll make our camp at the confluence of Big Creek. Here, there will be time to hike or fish for rainbow trout in Big Creek. If you feel less active, you’ll be able to wander with your camera through this beautiful valley or simply relax with a good book. Our layover at Big Creek allows time to sit back and soak-in the surroundings of this spectacular river canyon and ponder the greatness of this expedition. You can bide your time with a long hike up Dome Mountain, fishing for trout, soaking in the creek and relaxing in our wilderness camp. It’s a great day for appreciating how far you’ve come and how special this remote region is. Fueled by another great breakfast and ready for more white water, we will break camp and immediately enter the Big Creek rapids. Lots of fun, splashy rapids and accelerating current keep the pace up as we whirl past towering hoodoos and dramatic canyons. Our adventures are capped with a wild ride through Farwell Canyon as we eventually enter California bighorn sheep country, hopefully spotting a herd or two. Soon we’ll enter the Gates of Mordor and challenge Big John Canyon. This stretch of the Chilcotin River features countless massive wave trains that roller coaster for miles in a rushing chorus down deep desert canyons only to dissipate into the mighty volume of the Fraser River. In this country, there will be plenty of photo opportunities for the camera buff. The rolling grasslands and the massive canyons provide a dramatic backdrop to the white-water experience. Tonight we will camp on one of the many massive beaches of the Fraser River. After a peaceful float down the mighty Fraser River we’ll arrive at our take-out point by the historic Gang Ranch. Here we’ll board our vehicles for the shuttle to Williams Lake Airport to meet our plane for the spectacular ride back over the Coast Mountains and eventually reach the Pacific. Weather permitting, we plan to arrive back to Vancouver by 3:00 PM. 2-Person Tent: We provide 2 person tents. It is assumed you will share this tent with another person. You can (if you prefer) have a tent to yourself for an additional charge of $50 per tent (plus tax). The details of our roundtrip flight from Vancouver to Williams Lake Airport will be confirmed closer to the trip date. It’s likely the departure time will be as early as 8:00 AM and no later than 12:00 noon and will depart from Airport South, near the Vancouver International Airport. This is not the main Vancouver International Airport. Any taxi can take you to Airport South from the main airport (a 10-15 minute drive) or from your hotel. For those driving, there is long-term parking available for a daily charge. Check-in begins one hour before our scenic flight to Williams Lake Airport, about a one hour flight. You will not be met by an OARS guide in Vancouver; instead, you’ll meet one of our guides upon arrival to Williams Lake. We’ll have lunch in Williams Lake then transfer by vehicle to our riverside camp, a 4-hour drive*. Please note: If you plan to arrive at Vancouver International Airport on day 1, it is essential you arrive a minimum of three hours before our flight. You need to allow enough time for possible flight delays, time to clear customs and time to transfer from the Vancouver International Airport to Airport South. *If you wish to avoid the 4-hour drive from Williams Lake to the Chilko River, we can arrange a direct charter flight for an additional cost. Options include flying into the nearby airstrip at Chilko Lake, or to Chilko Lake by amphibious plane. Note, these flights are sensitive to weather conditions and therefore at greater risk of being delayed or cancelled. For more information please speak to your OARS Adventure Consultant. Vancouver International Airport is served by numerous air carriers and unless you have pre-trip plans elsewhere in Canada, this will be your point of arrival in Canada. Vancouver, British Columbia is 140 miles from Seattle, Washington and the drive itself takes approximately 3 hours. Keep in mind you will have to cross the border, and there may be traffic delays depending on your timing. Do not pack your passport in your checked luggage. If you are carrying a customs form, please keep it in a safe place at all times (we do not recommend carrying it in the passport because you often must submit the passport at hotels, where reception clerks can easily lose the form.) While on the river, we recommend you pack your passport in a zip-lock bag that you can store in the bottom of your waterproof dry bag. Visas are not required for U.S. citizens to enter Canada. For non-U.S. citizens, please check with the consulate. The Chilko-Chilcotin-Fraser is considered a Class III-IV river system with a number of extended drops. The Chilko flows into the Chilcotin River, which flows into the mighty Fraser River. This free flowing waterway is perfect to raft from May through September. Our Chilko River adventure winds through lush alpine forests, narrow canyons, high desert plateaus and skyscraping hoodoos, and then ends 3,000 vertical feet lower and one week later on the Fraser River, the lifeblood of Canada’s largest river system. The route runs through Lava, Big John and Farwell canyons, and it is known to have the continent’s longest stretch of commercially navigable whitewater. Inflatable Kayak (day 2 only)—Inflatable kayaks float low to the water, putting you in touch with the pull of the current and splash of every wave. On most trips, double and single inflatable kayaks are available, depending on group size. Helmets always required. Our first two nights are at the Bear’s Den basecamp, where you’ll be accommodated in our pre-set tents. Beginning day 3, after each active day on the river, we pull ashore to camp for the night. Upon arrival, our first task is to unload the boats using a bag line of crew and passengers to expedite the process. Individuals then collect their waterproof bags and locate an area on the beach to camp for the night. On the first night in camp, a crew member will give a demonstration on setting up a tent, which you’ll see is quick and easy. The guides will set up the kitchen and central dining/seating area with camp chairs. They will also locate a secluded area away from camp to set up the portable toilet, where privacy is assured. We provide a selection of beer, wine and some liqueurs in the evening. We also supply a selection of appropriate non-alcoholic beverages with meals and plenty of fresh drinking water throughout the day. For your safety and the safety of others, alcoholic beverages are limited to camp. Our drinking carried with us from Bear Camp or comes from the river and is filtered for consumption (no iodine is used in the purification process). We store the purified water in large containers that are accessible in camp, at lunch time and before hikes for filling personal water bottles. Each day varies, but on an average you’ll spend 4-6 hours a day on the boats. The rest of the time will be spent exploring, relaxing in camp or eating. While we generally plan a few guided hikes on each trip, there is ample opportunity for the curious to explore the area at length. Please let your trip leader know if you are an avid hiker and remember to bring a water bottle and good shoes. All hikes are optional, and you can choose to lie on the beach, sit by the river and take in a few tanning rays or read a book instead. The Chilko watershed is a world-class fishing river. For fly fishermen, there are plenty of rainbow trout and dolly varden. It has the third largest sockeye salmon run in the province (over 2 million return annually) and is a spawning ground for spring and coho salmon, as well as steelhead. If you plan to fish, you will need to bring your own gear. We suggest you bring a rod with case and the smallest of tackle boxes with the appropriate lures or flies. If you plan to fish you must have a license. A fishing license can be purchased online at the following links or in Vancouver if you have time. www.env.gov.bc.ca/fw/fish/licences/#Basic – This license is good for Chilko Lake (which you’ll visit on day 2) and everything downstream of the upper 17 miles of the Chilko River. www.env.gov.bc.ca/fw/fish/licences/#ClassifiedWaters – Fishing the classified waters section of the Chilko River (17 mile section from the headwaters; fly fish only) requires a “Class II” license (plus the basic license if fishing further downstream). While the idea of a river trip is appealing to most people, many are inhibited or reluctant because of modesty or uncertainty. To minimize our impact, we carry out all solid human waste and use a portable toilet system that is set up each day at camp in a secluded location a discrete distance from tent sites. It is essentially a toilet without plumbing, and it is available from the time you pull into camp each afternoon until you leave camp the next day. Toilet paper and a convenient hand-washing station are provided. On popular stretches of wilderness rivers, the common refrain is “dilution is the solution to pollution.” We practice this approach by urinating in the river during the day. Bathing is allowed in the river here and many people enjoy a swim. We recommend using a liquid biodegradable soap such as Campsuds or Dr. Bronner’s which can be purchased in most stores that have a camping section or at your local health food store. These soaps can also be used to wash clothes. Disposable anti-bacterial towelettes (Coleman Swash Cloths, baby wipes, etc.) are especially convenient as well. We provide a small waterproof bag (17” tall x 9” diameter—approximate sealed size) to hold your camera and other items you might need during the day. While these bags are designed to be waterproof, you may wish to place your camera in a zip-lock plastic bag or waterproof casing for additional protection. We also strongly recommend you take out a rider on your homeowner’s policy to cover your camera—especially if it’s fine equipment. If you are planning on bringing a digital camera, make sure to bring additional memory cards, batteries, and any other extras you will need. Disposable waterproof and panorama cameras are also a fun option. Many of our guests travel with their smartphone although cell service may be limited once you leave Vancouver. On a trip like this, there is always the risk of water damage to smartphones and other electronic devices, even when they are stowed in a dry bag. If you intend to take your phone or other electronic device with you on the water, consider investing in a small, waterproof container just for your phone. Once you are on the river there is limited communication with the “outside world.” Cell phone service is not available. Our guides carry satellite phones which are strictly used to call out in case of an emergency situation during the trip. If you have someone that needs to contact you about an emergency at home, they should call our office (800-346-6277). If possible, we will relay the message to you. Keep in mind it could be several days or longer before the message actually reaches you. For your family at home you should define for them what you consider an emergency and provide them with instructions to call our office in the event one occurs during your vacation. The weather is one of the few details we can’t control. However, we plan our trips for times when the likelihood of good weather is greatest. The Chilko-Chilcotin tends to be dry in climate and much warmer than the coast. In summer, daytime temps in the interior of B.C. can be quite warm, while the temperatures drop quite a bit during the evenings. While we don’t expect rain, it is always a possibility in British Columbia. Be sure to follow our recommended equipment list, as our experience suggests a multi-layering approach with a range of temperatures and conditions in mind. The temperature of the lake tends to be in the low to mid 50’s (°F). You’ll find the river to warm as we travel downstream, noticeably upon arriving at the confluence of the Chilcotin River and the Fraser River. The Canadian monetary unit is the Canadian dollar (CDN). Like U.S. currency, coins are the penny, nickel, quarter and the dollar or “Loonie” piece. More recently, a two-dollar coin has come into circulation to replace two-dollar bills. Avoid carrying large sums of cash at any time during your holiday. Credit cards are widely accepted. American dollars are accepted everywhere. If converting American to Canadian dollars, you’ll get the most favorable rates at banks. Most banks are open from 9:00 AM to 4:00 PM Monday to Friday, though some branches stay open later and on Saturday mornings. ATMs are everywhere. Even if you aren’t anticipating your menstrual period, come prepared for it. We recommend you bring some sandwich size zip-lock bags to separate and store your necessary items. They can be used during the day while you are on the river or hiking and can be disposed of when you reach camp. (For tampon users: o.b. ® tampons are ⅓ the size of regular tampons, tuck discreetly into pockets and have less paper wrapping.) Many women suggest bringing a small supply of baby wipes. In camp — When the weather is warm, lightweight cotton pants/skirt or shorts and shirt make great camp wear. Anytime the forecast calls for cool evenings and cold nights, a dry set of long underwear is the perfect base layer under long pants and a fleece sweater. During the day—The best choice on the river is an amphibious shoe that drains water, protects your toes and won’t come off in swirling current. A retired pair of athletic shoes can work well. Sport sandals with a heel strap are a good option, especially on rivers with sandy beaches. Neoprene, wool or fleece socks are recommended to help keep your feet warm while rafting. Find professional-grade options made by Chaco®, the official footwear sponsor of OARS guides. Hiking—Hikes along the river are short and can likely be done wearing your river shoes. If you prefer better support and comfort, lightweight hikers or running shoes should be sufficient for any hikes. During the day—Wide-brimmed hats are a good choice for sun protection. Ball caps are useful since they fit under helmets, which are required attire when paddling our whitewater rivers. In camp—When the weather is cool or cold, you’ll want a beanie-style hat to wear in camp. It is the perfect remedy for bed-head as you rise from your sleeping bag to secure your morning cup of coffee or tea, or for retaining warmth in the evening hours after the sun sets. Synthetic or merino wool long underwear is a must-have on river trips. It can be worn under shorts, rain gear, T-shirts, etc., then stripped off when the chill of the morning has worn off. It keeps you warm even if it’s wet (which can happen easily), dries quickly, and it’s compact enough to be stuffed into your small waterproof bag or daypack after you take it off. It can be layered under your waterproof rain jacket and pants. In cooler weather, a rain jacket and pants work better than a wetsuit because the jacket and pants can be put on when it’s cold or when you’re going through whitewater, then easily taken off when the sun comes out and it’s hot. Be aware that cotton items, once wet, do not insulate; only synthetic and wool materials will keep you warm during cool, wet weather. Something warm for your top & bottom: You need to be prepared for inclement weather. Bring a good fleece or wool top and bottom, along with a warm hat and gloves. You’ll want to double-up on your base layers so that you’ll have a set to wear in the boat and a set for camp. Rain gear protects you rain, wind and the splash of the rapids. It is one of the essential items that all passengers should have no matter what time of year you are traveling. Look for jacket and pants that are 100% waterproof, not just water resistant. A hooded jacket is recommended as well as good secure closures around your head, neck, wrists and ankles. Do not bring a rain poncho as it cannot be worn under your PFD. Protecting yourself from the sun should be taken very seriously. A hat, sunscreen, lip balm and sunglasses are a must. In many cases, a long-sleeve shirt is the best method for preventing sunburn on your upper body. Light-weight long pants may also be appropriate to protect your legs if you’re not wearing a wetsuit. ☐ Swimsuit / swim trunks: 2- piece suits recommended for women. Tankinis are a great option. On our standard flight/travel package from Vancouver to Williams Lake, the checked baggage allowance is limited to 50 lbs (23 Kgs) per fare-paying passenger. Passengers are not restricted as to the number of pieces being checked, so long as the total weight does not exceed 50 lbs. Baggage exceeding the allowance is subject to excess baggage rates. While we encourage you to travel light, you’ll also want to be sure you pack all the essentials and are prepared for both land and water environs. The personal equipment list addresses what you will need to wear in conjunction with our gear. Weight restrictions come into play with our domestic flight, so please follow our recommendations closely. We recommend you take on the river only what’s absolutely necessary. Keeping gear to a minimum ensures it will fit into the waterproof bags we supply and reduces unnecessary packing and unpacking in camp. If you have extra luggage, you may be able to store it at the hotel where you are staying prior to the river trip, if you are planning to return there. You can also leave items at our basecamp and we will return your luggage to you at take-out (on day 8) before your flight back. We recommend that you leave your valuables at home. For personal items like wallets, purses and cell phones, we recommend putting them in a zip-lock bag at the bottom of your waterproof bag with your clothing. Items can be left at our basecamp and will be returned to you at take-out on day 8, but we assume no responsibility for lost or damaged items. A $500/person non-refundable deposit is required at the time of reservation. The balance is due 90 days prior to departure. O.A.R.S. International, Inc., R.O.A.M. Adventures, Inc. and cooperating agencies act only in the capacity of agent for the participants in all matters relating to transportation and/or all other related travel services, and assume no responsibility however caused for injury, loss or damage to person or property in connection with any service, including but not limited to that resulting directly or indirectly from acts of God, detention, annoyance, delays and expenses arising from quarantine, strikes, theft, pilferage, force majeure, failure of any means of conveyance to arrive or depart as scheduled, civil disturbances, government restrictions or regulations, and discrepancies or change in transit over which it has no control. Reasonable changes in itinerary may be made where deemed advisable for the comfort and well-being of the participants, including cancellation due to water fluctuation, insufficient bookings, (this trip requires a minimum of 4 guests), and other factors. There is risk in whitewater rafting, particularly during high-water conditions. Rafts, dories and kayaks do capsize. You could be swept overboard. Your guide will make every attempt to assist, but you must be strong and agile enough to “self-help” and “float-it-out” without further endangering yourself or others. We reserve the right not to accept passengers weighing more than 260 pounds or with a waist/chest size exceeding 56 inches. We may decide, at any time, to exclude any person or group for any reason we feel is related to the safety of our trips. We are experienced at accommodating people with various disabilities. Please give us an opportunity to make you feel welcome. We need to discuss any special requirements ahead of time. On advancement of deposit the depositor agrees to be bound by the above recited terms and conditions. Prices subject to change without notice.